So a few of my friends jokingly refer to me as Martha- as in Martha Stewart. This reference probably started because of the number of times that we entertain at our house. We’re of the more-the-merrier variety at our house- and it’s usually merrier! I’m far from Martha in many areas however, and the top area that I need to improve on (or just hire someone for!) is gardening. I’m not sure what it is, but I can practically kill any plant by just looking at it. Every year I resolve to get better at it. 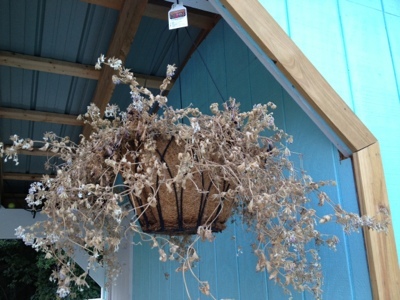 I get a new hanging basket or plant, and I’m all gung-ho for about 2 days. That’s when something inherently takes over in me, and I commence in operation fry-the-plant. This beauty was a Mother’s Day present. I once had visions of the beautiful white and purple flowers cascading over this basket all season long as I admired it from my nearby chaise Lounge. Instead, it met it’s time of death sometime during the heat wave in the last week of July. Now I could never quite pinpoint it’s actual time of death because that would require me paying attention to it in the slightest, instead of noticing one day that “Man, that plant is really brown, and I honestly can’t recall when was the last time I watered it.